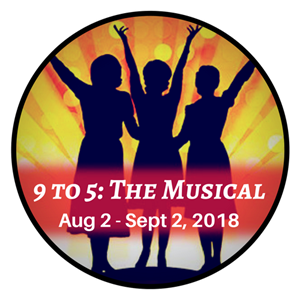 9 to Five: The Musical is based on the seminal 1980 hit movie which starred Lily Tomlin, Jane Fonda, Dolly Parton, and Dabney Coleman. Set in the late 1970s. this hilarious story of friendship and revenge in the Rolodex era is outrageous, thought-provoking and even a little romantic. Pushed to the boiling point, three female co-workers concoct a plan to get even with the sexist, egotistical, lying, hypocritical bigot they call their boss. In a hilarious turn of events, Violet, Judy, and Doralee live out their wildest fantasy – giving their boss the boot! While their boss, Mr. Hart, remains "otherwise engaged," the women give their workplace a dream makeover, taking control of the company that had always kept them down. Hey, a girl can scheme, can't she? Anytime. Leave a message, and a volunteer will call you back. Reschedule for a future performance of the current show or another show. Keep your ticket! Call 410/268-9212 to make a new reservation, and physically exchange the rain out ticket at the Ticket Office.